Latest version: 2.6.1 build 606. June 6, 2018. Virtual Null Modem is a utility, which purpose is to emulate one or more RS232 serial ports connected via virtual null-modem cable. Otherwise, you can create any number of pure virtual serial ports in your system (COM10, COM11, COM127 etc), that will be connected to each other via virtual null-modem cable. What problems can be solved with Virtual Null Modem? You can create two virtual serial ports: COM10 and COM12 and connect two different applications to them. Everything, that application #1 will send to COM10 will be received by application #2 at COM12, and all that application #2 sends to COM12 will be received by application #1 at COM10. Getting started is easy. Virtual Null Modem is ready! After installing Virtual Null Modem, start it from the "Start->Programs" group. The program will ask you about creating a new null modem device. You should click the "Yes" button and select two serial ports number in a dialog window. Click the "OK" button in the dialog window and click the "OK" button in the main window. Now, your virtual serial ports are ready. 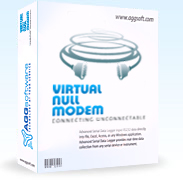 Virtual Null Modem supplies a three cut down versions called Professional, Standard and Lite. Standard and Lite versions omit some of the advanced features found in the professional edition and is ideal for users who either want a low cost or free solution or are not interested in more advanced features. Read more here.